It's your special day! 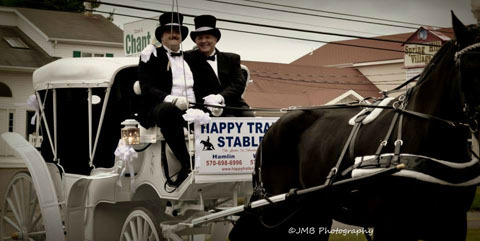 Complete your fairytale with our gorgeous white convertible top carriage and the handsome jet black Percheron Toby pulling up to drop you off with style and tradition in front of all your friends and family! Get whisked away as husband and wife after your ceremony with our 'Just Married' signs in tow. Our driver Tom, can dress to impress in a suit or for a themed event, put on his cowboy best. Toby and Tom will travel and because everyone's wedding day is unique you must call for pricing.